It was a potent and durable symbol, and lasted through and beyond the War. For Don the Beachcomber, the Morse code “V” for Victory—”dit-dit-dit-dah“—was the inspiration for his Tiki tribute to the achievements and sacrifices of American soldiers and seamen: Three Dots and a Dash. The Three Dots is another of Donn Beach’s creations that seemed lost to history until Jeff Berry sussed out the formula, and published it in his 2007 Sippin’ Safari. 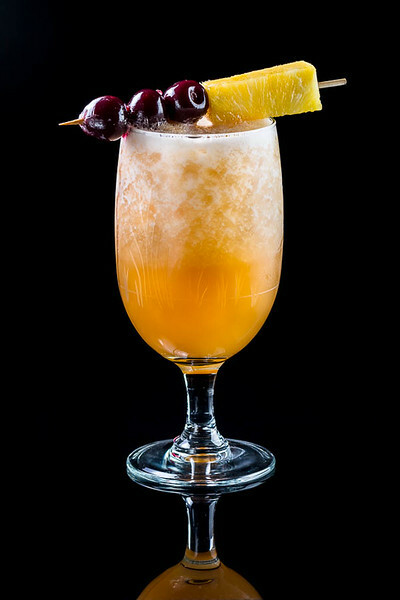 It has all the hallmarks of classic Don the Beachcomber styling: multiple rums, multiple fruit juices, a hefty dose of spices, and an ostentatious garnish. The pimento, or allspice, liqueur is the special, spicy flavor driver of Three Dots. Without it, the drink is a run of the mill fruity rum drink with nothing much to distinguish it. The allspice liqueur gives a solid, apple-pie aspect to the drink, with earthy clove and cinnamon coming to the fore—very similar to the flavors of Berry’s own Ancient Mariner. Martinique’s rums are made in the rhum agricole style—distilled from fermented cane juice, rather than from molasses. As a result, they are a bit dryer and grassier than molasses-based rums, and considerably less sweet. That that small portion of Demerara rum adds a bit of sweetness back into the drink’s rum profile. That remarkable garnish makes the Three Dots and a Dash one of the few cocktails that can be recognized from across the room. Simple and symbolic. And the pineapple adds a nice tropical sweetness to the drink’s nose, too. The result is a complex flavor treat, rummy and spicy, and powerfully cold and frothy after its trip through the blender. Lime and orange, clove, cinnamon, pepper, honey, and the taste of Caribbean rum; Don the Beachcomber played all his cards for this tribute to the American soldier and victory in World War II. Each time I’ve made Three Dots, with that Morse “V” across the top, I’ve thought of my parents, coming of age with their futures hanging in the balance in a world at war. There will never be a way for me to understand the depth of feeling that the end of World War II brought to them, and to other everyday citizens and soldiers, no matter which side, winning or losing. My father tried do describe those days, but it was clear that you had to be there. Yeah, Three Dots is just a tiki drink, a tasty bit of midcentury drinking culture, but it still has the power to make me think of more important things. Every time. “Three Dots and a Dash” at cold-glass.com : All text and photos © 2015 Douglas M. Ford. All rights reserved. There is a relatively new tiki bar in Chicago called “Three Dots and a Dash” that is keeping alive this tradition. Highly recommended if you’re in Chicago this summer. I have heard of Three Dots bar, but so far haven’t been able to get there. I’ve seen that they do an interesting variant of the original recipe, using orange liqueur instead of orange juice. A touch sweeter, I would expect. Looking forward to trying it. Thanks for the reminder! This sounds like my kind of cocktail and entirely suitable for VE Day commem or VJ Day commem. I’d never HEARD of Falernum, and now I’m planning to make some following your very clear instructions. You can teach an old dog (or in my case old b**ch new tricks!!!! Yes, definitely a commemorative cocktail. Here’s to your first batch of falernum!